Cartoon Wars 2: Heroes by Blue GNC takes the formula of the first two games and turns everything up a serious notch. Though the premise is simple (dispatch stick-figure minions from your castle to destroy the opposing army and their castle), the game is packed with features and customizable options that will almost make you feel as though you’re cheating the system by spending only a dollar. For those new to the series, Cartoon Wars is a strategy/defense game starring an army of lovable stick figures who are hell-bent on destroying their enemies. The game boils down to selecting your troops, sending them into battle, and defending your castle. As the game progresses, you’ll earn different types of soldiers and weapons, making you a more formidable opponent in battle. In addition, you’ll be able to buy upgrades to your fortress and to your abilities. And while you’re sending your grunts out to slaughter, you’ll also need to help them along by shooting arrows over your castle walls or performing actions that basically amount to calling in an air strike. All of your actions are governed by an action meter, with each action costing a certain amount of points. For example, your first minions cost ten points to set out. Therefore, you must wait until your action meter has accrued at least ten points before you can send a new minion out to battle. 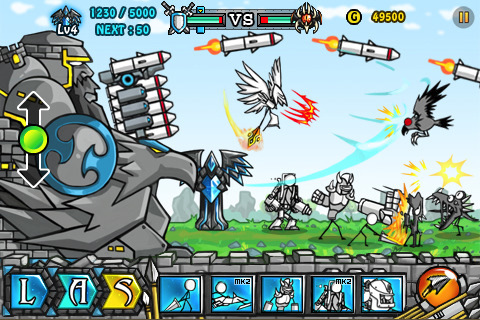 As the game progresses, the soldiers available to you become more and more advanced, until those stick figures are replaced by giant mechs, tanks, and other tools of destruction. Though the screen feels a bit cramped and cluttered, Cartoon Wars 2 plays really well after a bit of practice. In no time, you’ll find yourself giving commands, upgrading your levels, and striking foes with a barrage of arrows without giving it a second thought. However, the battlefield – which runs from left to right – takes up quite a bit of space. This means that in order to keep track of everything that’s going on, you’re going to have to use your finger to scroll back and forth. This takes some getting used to and if you’re not careful you may find your castle crumbling while you’re preoccupied at the other end of the battlefield. In between battles are short “Hero Missions”. 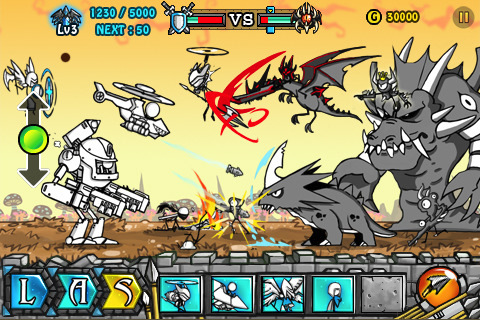 These levels involve a single hero (controlled by you) fighting off wave after wave of enemies in an arena-style space. The more enemies you pick off, the more points you earn. You’ll control the hero by using an on-screen button configuration that allows you to move around the screen and attack. While these levels serve to break up the battles and add a bit of variety, they’re not very interesting. And thanks to the clumsiness of on-screen button schemes, they’re also not very fun. Despite this minor hiccup, Cartoon Wars 2: Heroes is a great title and at a dollar, it’s also a no-brainer. There are dozens of levels, a seemingly endless amount of options, and the humor of seeing stick figure armies bludgeon eachother to death never gets old. Bottom Line: Cartoon Wars 2: Heroes is a must buy for its humor, action, and for the sheer amount of features it includes. 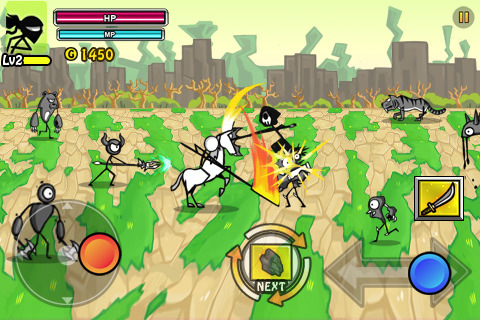 Cartoon Wars 2 is compatible with iPhone, iPod touch, and iPad. Requires iOS 3.0 or later.